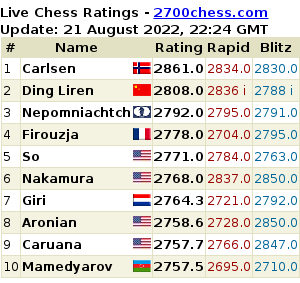 "The federation has no money, the balance is unfavorable..."
Levon Aronian: "I'm Friendly in Everyday Life and a Fighter Over the Board"
"I will never be able to play pragmatic chess..."
"We are happy to have Gelfand in Norway..."
Cristobal Henriquez: "I learned from Karpov, Smyslov, Fischer games"
"It was a joy just to play against Gelfand..."
Want to Lose an Opposite-Coloured Bishops Endgame? Ask Mickey How! "Let's imagine the same tournament played under one special condition..."
Boris Gelfand: "I Think the Grand Prix is Great. The Criticism is Mostly Political"
"I don't understand why there is so much criticism..."
Why should stalemate be a draw?.. 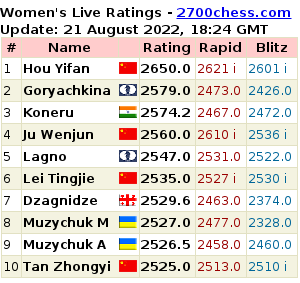 "The girl burst into tears: she had already prepared to play against Kramnik..."
"The blitz form is something not to be predicted..."
Sochi. From Petrosian to Tal. Blitz (Day 1). "The 4th tournament in a row is no problem for Gelfand at all..."